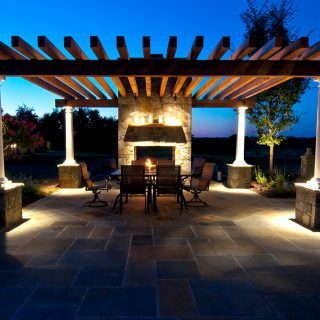 Outdoor lighting is much more than just an attractive accent to your landscaping. It actually provides a variety of advantages that might not be immediately obvious. From safety to security to aesthetics, a premium-quality landscape lighting system from Clearwater Landscape & Nursery will benefit you and your home in many ways. Plus, the Clearwater team specializes in designing and installing your outdoor lighting system to work in harmony with your house, hardscapes, and landscaping for a cohesive appearance that will make your home the envy of your neighborhood. 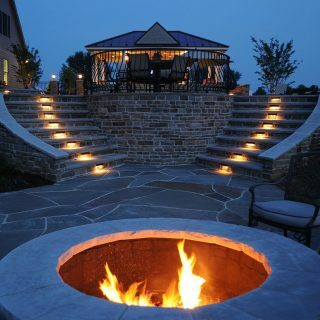 The possibilities with outdoor lighting are far broader and more extensive than most people might consider. There are practical fixtures like path lights and step lights that make it safer and easier to move around your outdoor spaces at night. There are stylish lanterns and pier lights that illuminate your driveway and entryways to welcome guests to your home. Also, there are a wide range of artistic applications for outdoor lighting, such as strategically illuminating trees and other foliage to create a layered sense of space and a beautiful canopy above your yard. At Clearwater, our in-house team of designers treat each outdoor lighting project as a new opportunity to create something unique and beautiful. Our custom designs are tailored to your property and carefully integrated with your landscaping and hardscapes for the very best results available. Outdoor lighting systems are a well-established way to enhance your home’s night-time security. Illuminating your driveway, walkways, yard, and natural areas will keep would-be intruders from moving around your property unseen. Landscape lighting also makes it far more difficult to tell if your home is unoccupied while you’re traveling for business or on vacation. Because dark homes are far more attractive targets for burglars, many insurance companies actually offer clients a discount for having an outdoor lighting system installed. Who doesn’t want lower insurance premiums? A dark property can be dangerous for you, your family, and your friends. If you’re unable to see the path you’re walking on or the obstacle you’re approaching, it’s easy to trip and fall, creating the potential for injury. Plus, if you’re hosting a party, you’re financially liable for injuries that occur on your property, even if they’re the result of an accident. A well-designed outdoor lighting system will ensure everyone can see clearly as they walk around your property at night, lowering the chances for such mishaps and helping keep everyone safe. All of the benefits discussed above—style, security, safety—make quality outdoor lighting systems a valuable addition to your property. In fact, there’s no better way to enhance your home’s night-time curb appeal than using artfully designed lighting to emphasize its best features while creating dynamic space and a unique sense of style. 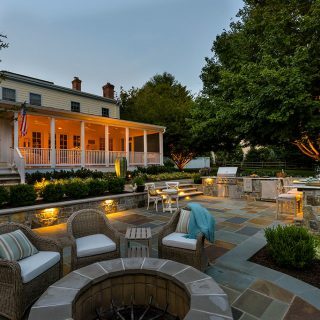 Here in the ultra-competitive DC-area real estate market, landscape lighting is a proven way to set your home apart from the rest, attract more buyers, and sell at a higher price. Interested in seeing examples of our capabilities and experience with custom outdoor lighting design and installation? 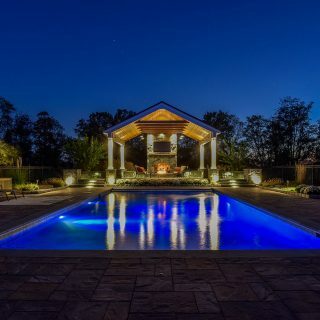 Please click below to explore our photo gallery of outdoor lighting projects for further information about our top-quality work.